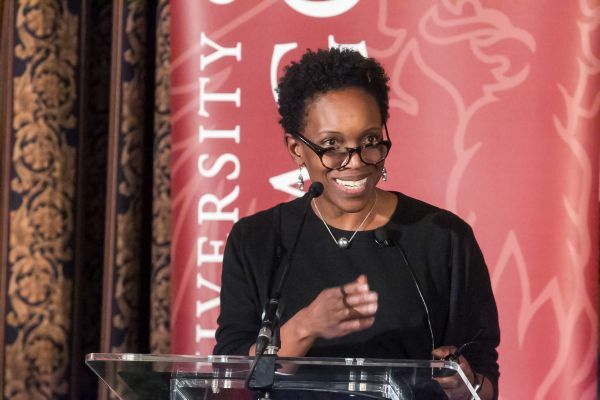 The Diversity Leadership Awards seek to recognize University faculty and staff members who display leadership in fostering diversity both on campus and within the surrounding community and to highlight, in concert with the University of Chicago Alumni Board, the contributions of alumni who advance the cause of justice and equality in our community and society. Please consider nominating a faculty member, staff member, or alumna/us for a Diversity Leadership Award. In doing so, you help recognize those who fulfill our obligation to promote a University and society characterized by diversity, equity, and inclusion. All University of Chicago/University of Chicago Medical Center faculty and staff members and alumni of the College, graduate divisions, and professional schools are eligible. The Diversity Leadership Council welcomes all nominations, including self-nominations. Submit a nomination by November 2, 2018. 2018 Diversity Leadership Award recipients Randolph N. Stone (faculty award), Sunny Fischer (alumni award),and Scott Cook (staff award) are joined by President Robert J. Zimmer, Vice Provost Melissa Gilliam, Rev. 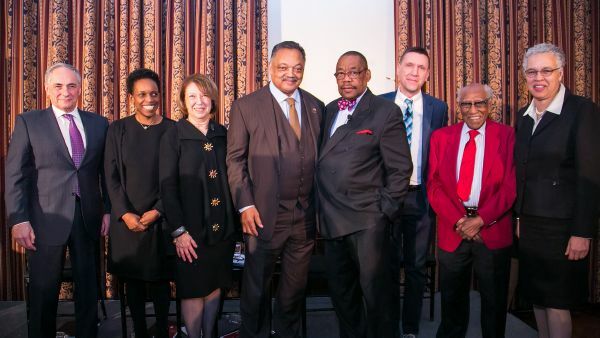 Jesse L. Jackson Sr., Timuel D. Black, and Toni Preckwinkle. 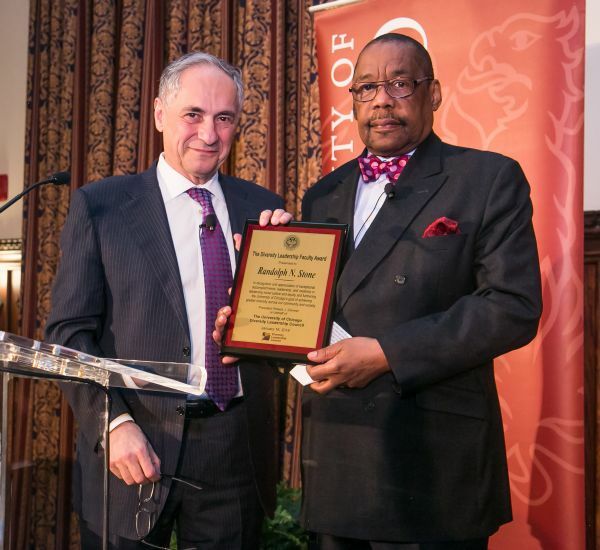 President Zimmer presents the 2018 Diversity Leadership Faculty Award to Randolph N. Stone, clinical professor of law and co-director and founder of the Criminal and Juvenile Justice Project Clinic. 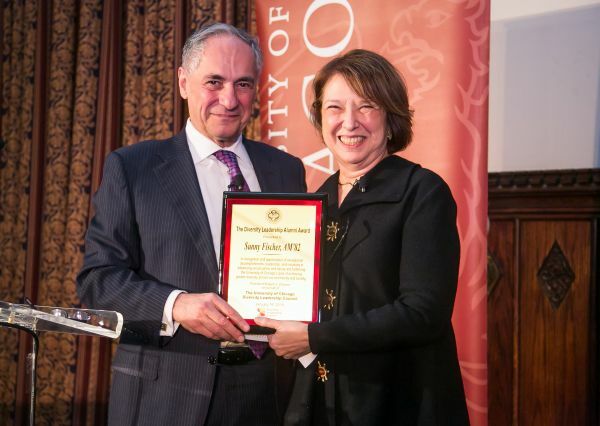 President Zimmer presents the 2018 Diversity Leadership Alumni Award to Sunny Fischer, AM'82, longtime leader in progressive philanthropy and board chair of the National Public Housing Museum. 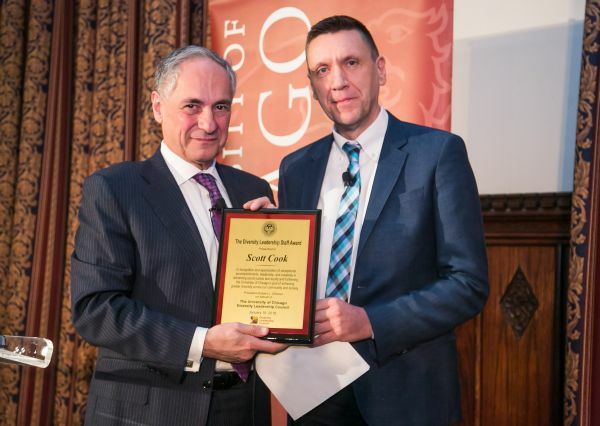 President Zimmer presents the 2018 Diversity Leadership Staff Award to Scott Cook, deputy director of Finding Answers and quality improvement and clinical transformation strategist for the Department of Diversity, Inclusion, and Equity at the University of Chicago Medicine. Vice Provost Melissa Gilliam offers remarks at the 2018 Diversity Leadership Awards reception.